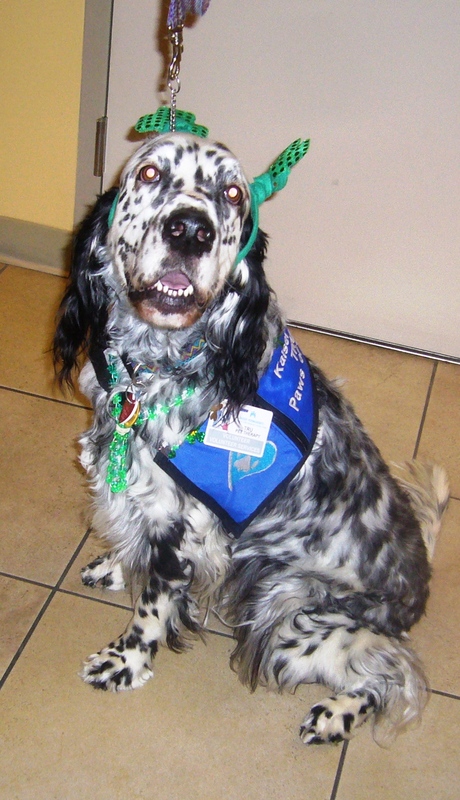 Meet Tru, Kaiser Permanente Therapy dog. She makes sick people feel well, even if for a few moments only. Do you think she cares that she has a crooked shamrock on her head or that her spots don’t match? I think not! Tru says to the world that you can have joy in less than peaceful circumstances. She is Tru (pun intended) to herself. This is a theme for me these days. Our house, for the past six months, has been in a constant state of change/upheaval/mess. First came the renter in October, so the office went buh bye. So did our dining room which became the new office. So did the TV room which became the new dining room. The living room stayed the same! Woo hoo! Good news! The bad news… we had to get rid of 600 square feet worth of junk, not to mention that the kids had to choose what they valued most from their junk pile of flammable crap treasures in the TV room and consolidate it into their shared bedroom. Which has not shelves. It also meant that the kids had to throw out some of their crap treasures when it all didn’t fit in the hallway closet. There were, to say the least, lots of tears, fits, anxiety and tantrums. I eventually wiped my eyes the kids’ eyes though and helped them see this as a learning experience. Tourettes truly taught me this. Ask any of my friends, and they will tell you that when Stink was first diagnosed, I was a basket case. Every tic was cause for alarm bells. No doctor could see me fast enough. No amount of “It’ll be okay” shoulder rubbing would suffice. I wanted perfection (no tics) and I wanted it immediately. I say all this because, finally… dare I type this… my house is sliding into place again. And with that place – and space – I am finding peace. But it wasn’t instantaneous. It took patience and time and work and, yeah, a few tears. But no one could do it but me. I had to set the tone – for my kids, my husband, my friends (who pitched in) and for, most important of all, ME. Just a few thoughts I had this Monday afternoon. What about you? Whatcha thinking? I want to know! tic free for 2 and a half months!!! (Natural calm for kids? Dunno but started it a couple of months ago). Had some stress this week and a mild blinking starting and a couple of body jerks. But guess what? I’m okay with it too. Maybe cause it’s not the scary christmas tic? Most likely. But totally not freaking out this time- although I was hoping to get to the milestone of three full months. oh well, next time maybe. So glad you guys are doing well too. Prayers for the status quo. Yeah! You know, I believe that the Natural calm does help. It’s the magnesium. Good for you! So happy!